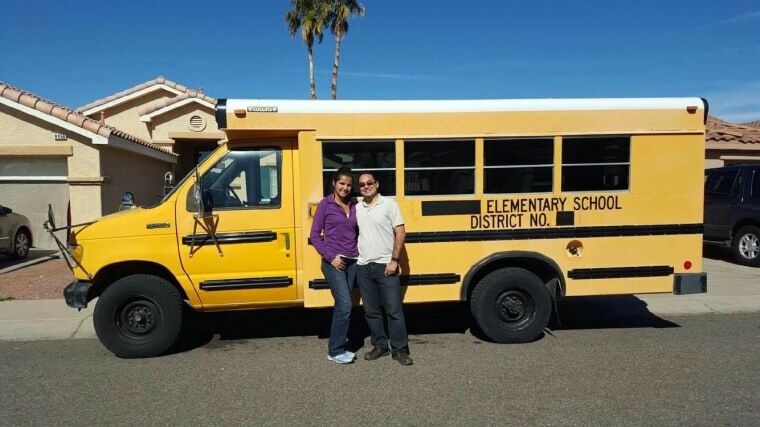 PHOENIX — Celso Salinas-Mireles couldn’t wait to show people the yellow school bus sitting in his parent’s back yard. He would gleam with excitement and possibility every time he talked about it. He and his wife, Ileana Salinas-Mireles, bought it last year and planned to turn it into an RV. They wanted to use it to travel across the country spreading their music with migrant communities. He played the guitar and she sang songs of social justice and love. Last week, those dreams were shattered. He passed away when a woman ran a red light and crashed into his motorcycle. He was 30 years old. The first time I saw that school bus was on his 29th birthday. A few friends and I went over to his parents' house for dinner. Celso took us to the backyard, and his face lit up as he talked about the bus and what it would become. He and Ileana had already taken out the seats and planed to retrofit the bus for their journey. Where so many of us fail to pursue our dreams, Celso had a gift for making them a reality. That’s the motto he lived by. Celso was born in Juárez, Mexico, and he was 3 years old when he and his family moved to Phoenix. He grew up undocumented and with an urge to succeed so that the sacrifices his parents made by bringing him here wouldn’t be in vain. His good grades earned him a full scholarship to Arizona State University. He graduated with a business degree from ASU in May 2009. But five days after his graduation, he found himself in Colorado with his dad farming an alfalfa field. He couldn’t use his degree to work because he was undocumented. He once described the experience as demoralizing. However, it didn’t crush his dreams. A few months later, Celso was back in Arizona. Still unable to use his college degree to get a job because of his immigration status, he created his own job. He taught himself how to code and began freelancing as a web developer. His big dream was to one day become a software developer. In his pursuit of that dream, he never lost sight of another one of his passions: fighting for migrant rights and social justice. The co-founder of the Dream Act Coalition, he contributed to the movement in the best way he knew how – by using his technology skills. He was the behind-the-scenes kind of guy creating websites, online petitions and social media campaigns on behalf of pro-immigrant and social justice organizations. One of his latest projects involved developing a web application to alert people of immigration raids. He also contributed with his music. He, alongside Ileana, had a talent of lifting up people’s spirits during the darkest times. The night before SB 1070 was signed into law, for example, he and Ileana brought a sense of hope with their music at a vigil. When the DREAM Act failed to get enough votes to pass in 2010, he and Ileana again lifted people’s spirits with their songs of encouragement. It shatters my heart into pieces to know Celso’s life was cut short. But what comforts me is knowing he realized his biggest dream: making his parents feel the sacrifices they made by bringing him here were worth it. Using the work permit he received under the Deferred Action for Childhood Arrivals program, he was hired to work as a software developer for a tech company in Arizona earlier this year. I am so grateful to be able to celebrate my 30 years with the satisfaction that I've come this far. I didn't go to school for this. I learned by doing, by throwing myself out there into the world of freelancing and forcing myself to learn while trying to make a living out of each new skill. And I make sure to always remember who I am and where I come from. That's why I wear this belt to work. I've worked as a landscaper in this belt. I've sweated under the Arizona and Colorado sun in this belt. I have farmed alfalfa in this belt. I've cried in fear that I'll never get to make my parents' sacrifice worth it in this belt. I've dug trenches with a pick and shovel, knowing a university degree had my name on it in this belt. This belt given to me by my dad is at my center, and centers me. I can never forget where I came from, and I will always be proud of that. Gracias mama y papa por su sacrificio. No fue en vano. Celso's life was the ultimate example that his parent's sacrifices were not in vain. Celso, you will be missed.